Your 2-year-old son has tantrums all the time. Just moving his favorite chair can trigger a meltdown. He grunts and points when he wants something. He rarely looks you in the eye and often doesn’t respond to his name. The pediatrician isn’t concerned: “Your son lags on some measures but is ahead on others.” She suggests waiting a year so he can catch up. You breathe a sigh of relief…until your son’s behavior gets more difficult. You keep trying to explain it away, but your heart sinks every time he avoids playing with other kids. After a year, the pediatrician refers your son to what is sometimes called “early intervention,” which provides a couple hours a week of speech and occupational therapy. You’re thrilled: now you’ll see real improvement. Months later, anticipation has turned to anguish. Your son is now three and hasn’t improved much. You desperately want to help him and have a normal family life. But you’re exhausted and out of choices. This is a classic example of hiding from “the A-word” (autism). Parents are so terrified at the thought of their beloved child having a lifelong disorder that they avoid it. These parents also don’t know about options available to help. Asking your pediatrician additional questions, getting a diagnosis as soon as possible (two years old is not too early), and finding out about intensive therapies are the first steps toward a more promising future for your child and your family. Pediatricians may hide from the A-word because they don’t want to raise a false alarm. Further, when a doctor considers a child’s behavior piecemeal, it can be hard to see the entire picture. Did the doctor complete an M-CHAT at your child’s 18-month visit? Can she do another at the 24-month check-up? If the M-CHAT revealed that your child is at “medium risk” for autism, can the doctor provide a referral for early intervention and a full evaluation? If the M-CHAT showed that your child is at “low risk” for ASD, can the doctor still provide a referral to early intervention services? An evaluation will not change who your child is or the things you love about him/her. It will only help you understand more about his/her needs. 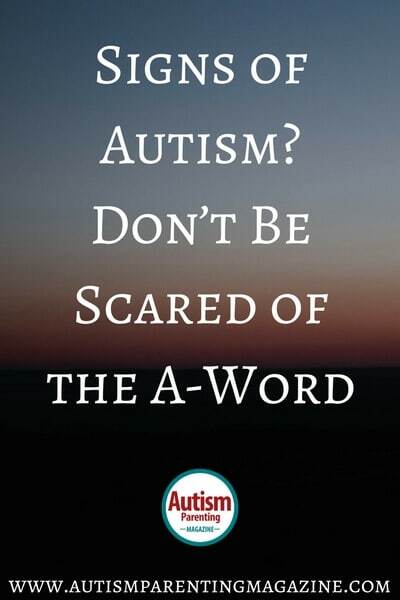 Learning that your child has autism spectrum disorder (ASD) can be frightening, especially because there is no known cure or clear prognosis. Yet the sooner your child is diagnosed, the sooner you will find a world of possibilities. A diagnosis is the first step in analyzing your son/daughter’s unique needs and receiving a prescription for therapy and services tailored to help. This may include speech, occupational, physical, and applied behavior analysis (ABA) therapy. ABA is a scientific, proven therapy for building adaptive skills, improving communication, and reducing challenging behaviors. As the only ASD treatment endorsed by the U.S. Surgeon General and the American Academy of Pediatrics, ABA complements other therapies your child may receive. Equally important, a diagnosis may make your child eligible for insurance coverage of up to 40 hours of therapy a week. Providers can offer suggestions to help navigate this process. Children’s brains are most open to learning quickly from 6 to 24 months of age (Huttenburg & Corten, 1987). Their brains are still very “neuroplastic” at age four and beyond, but this declines every year. A study of children receiving up to 30 hours of ABA therapy a week showed a gain of 16 IQ points as compared to children who received fewer hours (Smith et. al. 2000). Research reveals that 20 hours of therapy a week improved kids’ functional behaviors, language, and social skills (Dawson et al. 2012). The speech, occupational, developmental, and physical therapy that come with early programs can be very helpful. However, they are only a few hours a week. As the research confirms, children with autism benefit most from intensive therapy—up to 40 hours a week. So, the question is not early intervention or ABA therapy: it is how to combine them for the best results. Parents should know that the wait time for an assessment by a developmental pediatrician is six to nine months. Once a child is diagnosed with ASD, it usually takes about four months to research therapies, choose providers, and get insurance approval. This is the timeline no matter when you start. It’s another critical reason not to hide from the A-word. If you don’t begin the process until your daughter is five, intensive therapy won’t start until she is about six. But if your child is diagnosed at two or three years old, she’ll have many additional years to progress. She’ll also have extra time to learn age-appropriate skills and reduce challenging behaviors before starting school. For example, we worked with a four-year-old child who was not toilet trained, so her parents couldn’t leave the house without a full diaper bag. The child also became disruptive after sitting still for more than two minutes, which meant that going out for a casual family dinner wasn’t possible. After four to six months of intensive therapy, she was reliably potty trained in various environments and could sit for as long as 20 minutes. This opened up all sorts of new opportunities: doing errands together, going out for breakfast, and enjoying holiday celebrations with the extended family—no diapers required. ABA therapy could have helped the child learn these skills at age six instead of four. But that would have meant two more years of struggling with diapers, not to mention preventing her and her family from so many rewarding experiences. If you’re like most parents who have a child with autism, one of your biggest fears is that he/she won’t have friends. An early diagnosis can help build stronger social skills. Many parents who hide from the A-word enroll their child in preschool or other activities, where communication and behavior challenges often mean he/she is left out. Once your child is diagnosed and starts ABA therapy, there are new opportunities for friendships. Initially, many children with ASD don’t look at or talk to other children. After several months of social group or center-based ABA, many kids actively approach others. Instead of being excluded, they have the opportunity to make friends in ABA groups and the neighborhood. Parents who avoid an ASD diagnosis are usually isolated. Worried about being judged or revealing the extent of their child’s difficulties, parents hesitate to talk to family and friends about their concerns. A diagnosis can eliminate that isolation. It gives you access to a large community of parents who are dealing with similar challenges. They can suggest resources and listen when you’re feeling down. This encouragement, reassurance, and support make all the difference in helping you continue to be a great parent and a strong advocate for your child. Accepting the A-word can also help with anxiety about the future. Instead of worrying about how your daughter will cope in 5, 10, or 15 years, you and your ABA therapy team focus on today. What skills does your son/daughter need to reach the next step? What combination of therapies and school settings are best suited to his/her needs right now, next month, and next year? Parents who hide from the A-word have the best intentions, wishing to protect their child from a scary label and managing their own fears. Unfortunately, the result is usually the opposite. Without a diagnosis and intensive therapy, the child’s challenges increase, along with the parents’ worries. You may be exhausted and terrified, but there are many options. Getting an early diagnosis is the first step in giving your child new opportunities for growth and a future full of potential. Erica Pozzie is the Chief Clinical Officer for Autism Home Support Services, which is the Midwest’s largest provider of in-home ABA therapy and is based in Northbrook, Illinois. A Board Certified Behavior Analyst, she can be reached by email. Laura Bonfante manages AHSS’ Autism Center in Arlington Heights, Illinois. A Board Certified Behavior Analyst with 11 years of experience, Laura can be reached by email.